Most of the work that we do in our care for the livestock at The Farm School is focused on the development of effective systems. We try to maintain systems that support a positive environment for our animals, systems that we can use every day that preserve our physical wellbeing, and systems that will keep our animals healthy, growing, and content. Our animals appreciate repetition and predictability, and farmers appreciate having what they need at hand when they need it. This winter’s cold and snow has changed the physical environment of the farm so drastically that almost all of the systems we put in place this fall for winter livestock care have failed. The lines of the world have risen around us, and everything has become hard, brittle and rigid. The snow is so deep that the cows are peering down over their electric fences wondering if there’s anything greener on the other side. The cold has been so deep that wells and water lines have frozen deep underground. 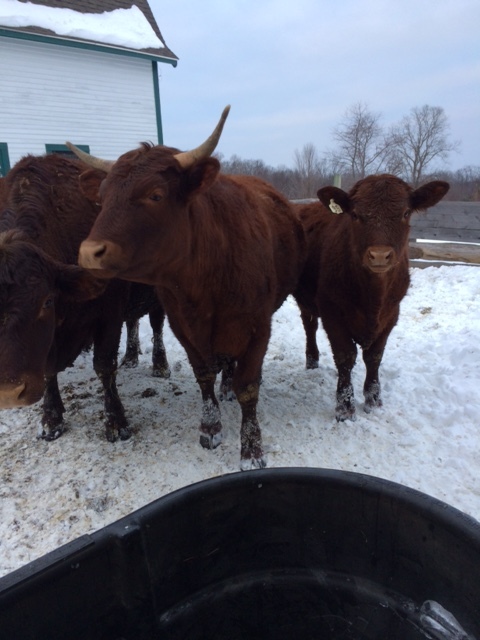 The snow has piled up around the water troughs so that the cows are almost kneeling to drink. Not only have the physical systems that we put in place proved to be inadequate, but our approach to work has as well. The snow is three or four feet deep, and stepping off the packed cow path into the soft pasture is a risky undertaking. I have found myself more than once laying out flat across impassible snowdrifts trying to reach electric fences. Here at The Farm School, we setup round wrapped bales of hay in grid patterns out on pasture for winter feeding for both the beef herd and the dairy herd. Then we use portable electric fences to expose the bales one at a time, giving the cows access to them as needed. We use fiberglass posts to hold the fence up out of the snow, and use a cordless drill with a large bit to drill holes into the frozen ground to put the fence posts in. This system allows us to feed the cows outside all winter, to spread nourishing manure on the fields that need it, and to avoid using a tractor, or ourselves, to move hay around. 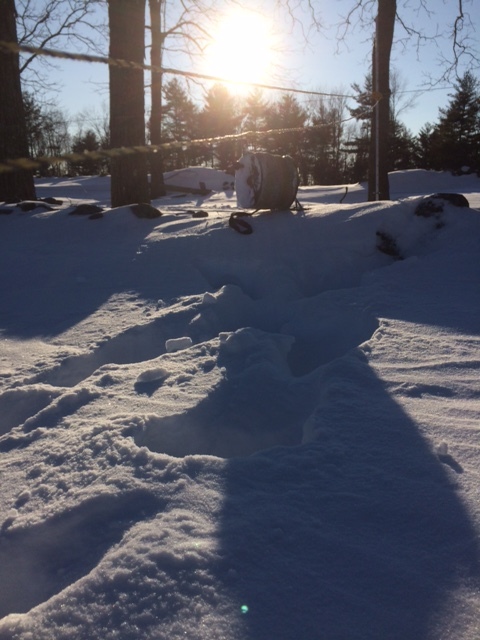 Last weekend I had to reset the electric fence in use around the bales setup for the dairy cows because the deep snow had made our carefully setup fencing system obsolete. 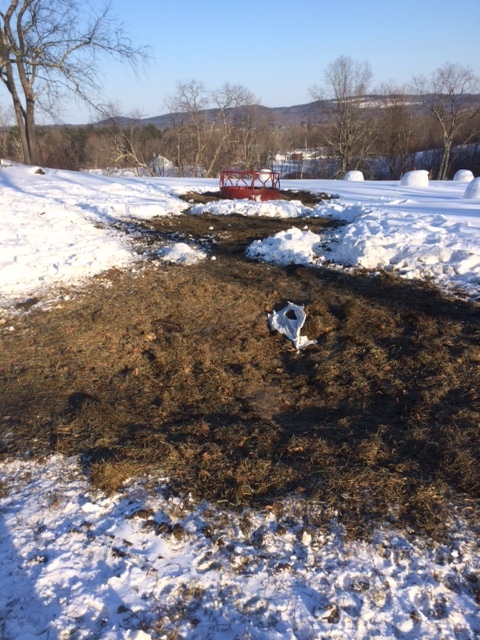 With three feet of snow in the pasture, the temperature seven below zero, and a twenty-mile-an-hour wind, the project took more planning than I ever could have imagined. I had to plot the whole endeavor step by step, to make sure that I had every tool I might need ready at hand, and to prepare my attire accordingly. There is no putting the drill down in three feet of soft snow. Gloves that come off have to be held onto, and they have to go back on pretty quickly. Tying a knot in an electric fence string with bare hands felt like one of those moments Jack London depicted in “To Build a Fire”. The whole endeavor felt like what I imagine a walk in space to be like, deep in a hostile and alien environment, trying to accomplish simple steps made suddenly and implausibly challenging. But when I cut open a bale, and peel off the plastic wrapping, warm fragrant green grass, kept as fresh as the day it was cut by the tight wrapping, springs out like a portion of summer, right there in the middle of a field lost in the snow. The wind howls and swirls in my eyes, but I can see the summer that has past, and I can imagine spring. The Farm School, in Athol, MA is starting a trial run of a weekly journal updating anyone interested on things happening on the farm. We are hoping to give readers a quick look at the work of the farm as it changes through the seasons, a little practical information about how we farm, and hopefully something to think about.